Senior Managing Partner, Gem Realty Capital Inc. In 1994, Michael Elrad co-founded GEM Realty Capital, where he is a Senior Managing Partner. GEM Realty Capital is a Chicago-based real estate investment company manages over $4 billion of assets. The company invests in private-market and publicly traded real estate through two lines of business, GEM Realty Properties and GEM Realty Securities. Mr. Elrad is actively involved in formulating and implementing GEM’s corporate strategy. As Chief Investment Officer of GEM Realty Securities, he oversees portfolio management, investment research, trading, operations and business development. As a member of GEM’s Investment Committee, Mr. Elrad is involved in setting investment strategy for GEM Realty Properties and GEM Realty Securities. 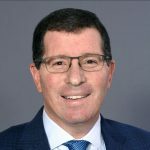 From 1989 to 1994, Mr. Elrad represented JMB Realty Corporation in the Loan Restructuring and Capital Markets Group and was named Vice President in 1992. In 1989, Mr. Elrad graduated from the Wharton School at the University of Pennsylvania, where he is a member of the Undergraduate Executive Board and remains active in the Young Presidents’ Organization. He also supports a number of educational scholarships and philanthropic endeavors.